Anytime your baby is in the car seat — be it in the car, on the stroller, in your house — the harness straps must be BUCKLED and SNUG. When unbuckled the baby can fall out of the seat – which is a frequent source of head injury. Besides falling out of the seat, there are 2 other hazards to being loosely buckled or unbuckled: 1. the child can get its neck caught in the straps and strangle and 2. the child’s head can fall into a position that is difficult for breathing and can stop breathing. Anytime your baby is in the car seat, the car seat should either be in the car, on the stroller – or ON THE FLOOR. 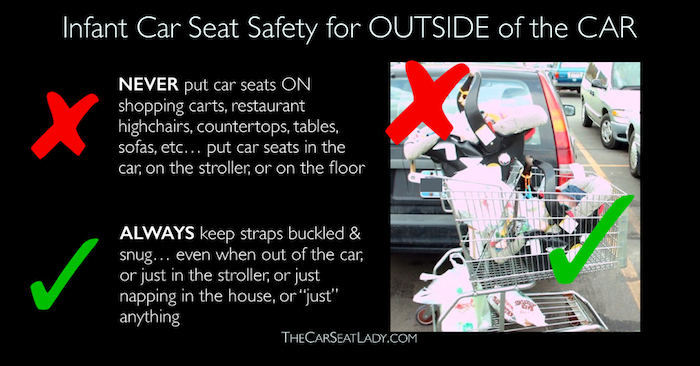 Never put the car seat on a shopping cart, restaurant high chair, counter top, bed, sofa, table, bench, etc – as the car seat can fall from these raised surfaces. If you bring the car seat into the store, put the car seat IN the basket of the shopping cart… rather than on top of the shopping cart. This video shows a baby who got LUCKY… most babies aren’t so lucky to have a store employee catch them as they fall out of the car seat from the top of the shopping cart. This baby wouldn’t have gotten into this pickle had the parent 1. buckled the child’s straps AND 2. not put the car seat on top of the cart. Put the car seat IN the shopping cart’s basket— not ON the shopping cart. 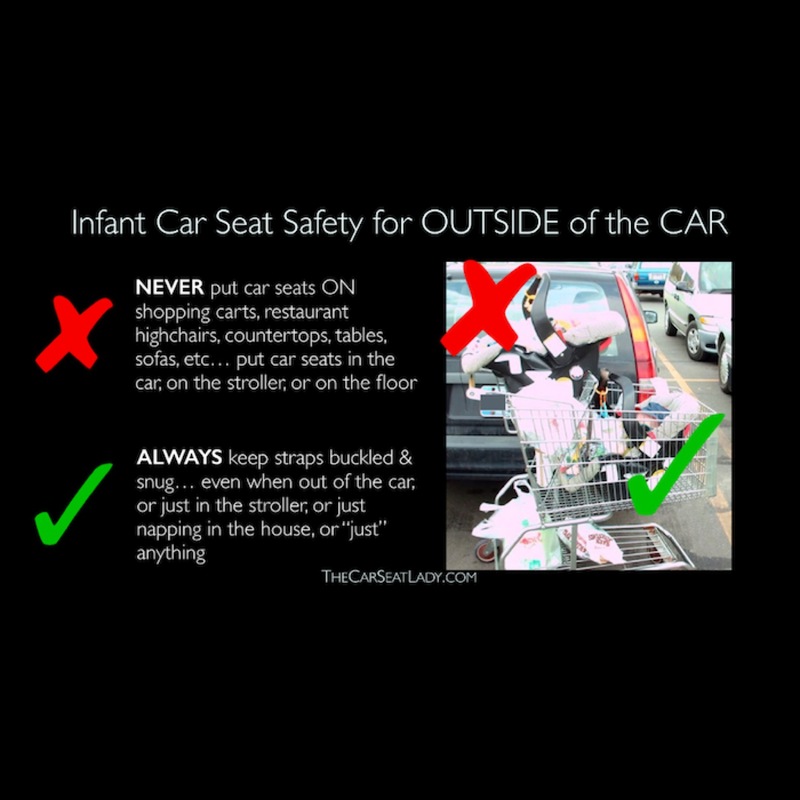 With regard to the Safe-Dock by SafeStrap… while it is better than having the car seat atop a standard shopping cart since it provides a way to secure the car seat to the cart, it still leaves open the possibility for serious head injury as it requires the parent to do 2 things… which are not always done – namely the parent must buckle the car seat into the cart AND keep the child buckled into the car seat. Parikh S, Wilson L. Hazardous Use of Car Seats Outside the Car in the United States, 2003–2007 Pediatrics. 2010;126:352-357. >Why must people be so judgemental???? Both of my kids have slept in their infant carrier!! depriving them of air??? I don't think so… did you know they only get deprived of air if the seat isn't at the proper angle??? and I'm sorry but here in Michigan I'm not taking my baby out of her seat to be carried in the store! how dumb does that sound… (I know Skye, I know you're freezing with the 3 feet of snow on the ground, but some lady on the internet told me it's not safe to keep you in your seat!!!) DUH!!!! now (whoops!! mommy slipped and fell on the ice… I'm sorry I fell on you!!) Yes! I am being sarcastic!!!! I hope you see that I will not be taking my 4 1/2 month old out of her carseat here in Michigan where it snows that is dangerous! lol!! >Great article for awareness. I'll be honest, I didn't know the correct way. However, I have a child that doesn't like her carseat, stroller, sling, swing, bouncy, etc. and so she was carried everywhere until she was 6 months old. Makes for an internet shopping mama. >Babies have also died lying in cribs,strollers, swings, and yes, even slings. Why?? Was it the fault of the sling? Was it the fault of the parents? Maybe. Are you to say? Am I? You're missing the point of this article. It's to be safety conscious. Nowhere in this article does it condemn those who put their babies in carriers. @lightflow – So if your baby falls asleep on a long car ride, do you take them out? Is that safe? Where I live, that's illegal. >I will still go with actual research than a person's personal experience. The mothers who had their children have a breathing episode and many who had their babies die were GOOD mothers. They were attentive and watching their babies. They just assumed, WRONGLY, that car seats are fine to leave baby to sleep in.I'm sorry for your surgeries, but I don't understand how a car seat being lugged around (12-15lbs in addition to the weight of the baby) is better for your back than using a stroller that lays flat. Chicco makes them and they've never been recalled… meaning you can get them for cheap used. There's a difference between being judgmental and being safety conscious. When studies SHOW that it's not safe, and you continue to do it, then it's not others being judgmental it's you being careless. Read the studies. >What is convenient for one person isn't necessarily convenient for everyone! People need to quit being so judgmental of others and worry about what works for them. If people pay attention to their babies no matter where they are,there won't be a problem. Its when adults are careless that their children get hurt. I personally am unable to use a carrier due to having so many surgeries on my back. I have both let my children sleep in their car-seats, and have been as safe as possible with it. >How about the studies done last year saying that 20% of infants sleeping in car seats (especially under the age of 4 months) will have an oxygen deprivation situation, and that some have died from being left sleeping in their car seat? I'm sorry, but if your baby is sleeping in the car seat when you arrive, take them OUT. Leaving them in there to sleep is dangerous, not convenient. I'll tell you something else as well. Putting your baby in a proper carrier (not a car seat but a chest carrier) is far more convenient when running errands.Look it up. "Car seat breathing 2009", you'll even find some deaths from being left to sleep in the seat. >I agree with Tori, like there are no injuries due to slings?? >I want to hold my baby all the time and I do alot but Im not going to wake him up to put him in a sling everytime I go from the car to a store. Sometimes our outings is the only time he sleeps during the day due to colic. >I don't think that's a valid argument. You can be quite bonded to your baby and not want to wake them so you can run errands. A baby carrier is a carseat, but it is also a BABY CARRIER. The real problem is people not paying attention and being careless. Let's focus on that and not condemn all people who let their babies sleep in their carriers. (Which isn't the issue.) Like I said, the issue is people who aren't paying attention, and/or haven't buckled their baby in correctly. It's common sense to never put the carrier in a high place. It's common sense to keep them buckled in. I think the real point is that people need to be made aware so they can keep their babies safe. >Yeah I'm with JillianEve on this one. Car seats are for cars, NOT for hauling babies around stores or for your baby to 'nap' in. Good god, are we so disconnected from our babies that we don't even want to hold them anymore? >car seats are for CARS, not for lugging your baby around with you for hours. that's what slings are for.